National Poison Prevention Week – Prevent Accidental Poisoning With These 5 Tips! Every year, during the third week of March, Poisonhelp.gov – a division of the US Health Resources and Services Administration – celebrates National Poison Prevention Week. National Poison Prevention Week has been established to raise awareness of poisonings, prevention of poison ingestion, and basic mitigation techniques in people of all ages – from young children to adults and senior citizens. This week was first established by Congress in 1961, and it is certainly for a great cause – poisoning is especially common among young children. In 2014, 55 US Poison Control Centers directed 2.2 million people in mitigating their poison exposure. Peak poison incidences occur from the ages of 1-4. Though people of all ages can be accidentally poisoned, children younger than 6 years comprise nearly half of all accidental poison exposure cases. Many of us nurses have seen the effects of accidental poison ingestion first-hand, especially in pediatrics. So to help you stay safe – and keep others safe – this National Poison Prevention Week, we have a quick list of tips to help you prevent accidental poisoning, and avoid exposing children (or adults) to dangerous compounds. This is the most simple tip in our guide. If children cannot access your medications or dangerous chemical compounds, they will be unable to ingest them – simple, right? High cupboards are useful for this. You can stash your bleaching agents, cleaning products, and other useful (but dangerous) household compounds such as Drano and other cleaners in high places that are inaccessible to children. If you don’t have an appropriately high, secure cabinet, consider investing in some childproof locks – magnetic locks are easy to install and use, and they deny access to a cabinet to anyone without a key. Don’t just toss your old medications or half-empty bottles of bleach into the garbage, or leave them out where they might be accidentally accessed. Follow FDA guidelines for disposing of medicines, and dispose of chemical compounds appropriately. Failing to do so can lead to dangerous situations – a toddler or small child could see a bright bottle in the trash, or sitting by your garbage can, and become interested in it. A crucial part of poison prevention is understanding the dangers that a particular product poses. A window cleaner such as Windex, for example, while containing harmful products that can be dangerous, is still much less serious when ingested as compared to compounds like bleach and drain cleaners. When you buy a new household chemical product, read the label – understand if it’s toxic or nontoxic, and store it accordingly. This will help you keep the most dangerous household products in your home safe from children, and understanding the effects of a chemical when ingested can help you react correctly in an emergency situation. Chemical products should be kept in their original containers as much as possible, for several reasons. First of all, the container that a chemical product is in often has valuable instructions for treatment of poisoning if it’s ingested – without these, you may not be able to take necessary steps to avoid injury or death. 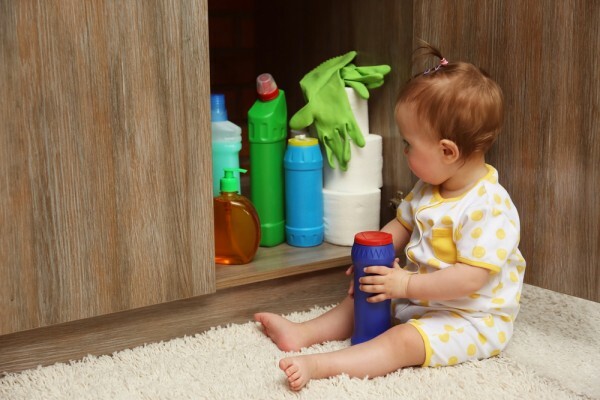 Secondly, children can be easily discouraged from accessing or using specific chemicals if their contents and containers are recognizable – and if these chemicals are moved into a different container, they may not be able to understand that they are dangerous. Finally, keeping chemicals in fun-looking or everyday containers such as interesting bottles or cups and jars can lure in children who are curious about what’s inside – making them more likely to ingest a dangerous poison. So keep your chemical products in their original containers – it will make your life much easier, and increase the safety of your children. You’re a nurse, so you’re used to emergency situations. However, if you’re dealing with your own child – or babysitting for a friend or loved one – the situation can be much different and induce panic. Don’t panic – find the chemical or medication that the child or adult ingested, and look for appropriate next steps on the bottle. After that, call the National Poison Control Hotline at (800) 222-1222 – the experts on the other line will help walk you through the required next steps of treatment, which may include induced vomiting, flushing affected areas with water, or a trip to the emergency room. Just try to stay calm when the worst happens – doing so gives the affected loved one the highest chance of surviving unharmed and allows you to react with the appropriate next steps for treatment. These five simple tips can help you prevent accidental poisoning, whether you’re at home or at work, and aid you as you work to reduce the preponderance of accidental poisoning among both, children and adults. So take the appropriate precautions to prevent poisoning – and understand the required steps for treatment in an accidental poisoning victim. By understanding both the prevention and treatment of poisoning, you can ensure that anyone you know who suffers from poisoning will have a better chance of getting through their ordeal unharmed. So whether you’re at home, or at the hospital, memorize these tips, implement them, and begin working towards a poison-free world.